The Board of Directors for the International Association of Registered Financial Consultants (IARFC) have determined the top three teams that are moving to the Finals of the IARFC National Financial Plan Competition. These Finals will take place on Thursday, March 21 at the IARFC Annual Conference in Nashville, TN. If the students were willing to work this hard for a fictional family, rest assured they will become professionals that will work hard to serve their actual clients...Dr. Luke Dean, Utah Valley University. 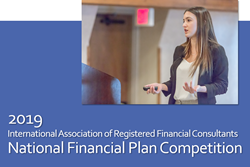 The National Financial Plan Competition is organized through the IARFC for undergraduate students in a curriculum related to Financial Services and supported in part by IARFC members and corporate backers such as 2019 sponsors Money Concepts International and Money Guide Pro. This competition gives students an exercise in real-world practices – that of analyzing a client’s situation and critically thinking a course of action. In many cases, professors have used this exercise as part of their curriculum. Participants were given a fictional case study of a family and an overview of their financial picture. From that data, teams were asked to produce a financial plan with recommendations for current and future action. The IARFC Annual Conference on March 20-22, includes CE presentations with national speakers, awards banquet, ethics program, and exhibitors. Registration to become a judge for the competition and attend the entire conference can be found on the IARFC website.